From time to time I will be writing about jewelry quality, or lack thereof, with actual examples from my files of jewelry items which illustrate quality issues. For this post, I have selected an emerald and diamond ring which was part of an evaluation shipment we received from a potential supplier. This supplier, by the way, was rejected because even though most of their jewelry items were of acceptable quality, there were quite a few that just don't make the grade, in our opinion. So we figured that if the supplier was OK with sending us this kind of junk, then there was no way we could trust them! 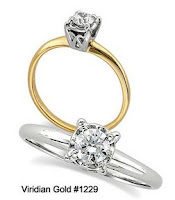 Anyway, this item illustrates several important points to look for in a gemstone ring. First of all, the emerald is genuine, but it is absolutely terrible in quality. "Clean" emeralds (that is, gemstones with few internal flaws, or inclusions) are very rare nowadays, so they command a high price. This particular gemstone is completely "occluded", that is, it is opaque, because of all of the inclusions. Well, that is understandable because of the rarity of a "clean" emerald . But, this stone is also very poorly cut--notice that its oval shape is distorted on the left side where part of the stone is missing or chipped off. Also, the mounting prongs are misshapen, so that they are not symmetrical around the stone. This is a tip-off that the manufacturer just did not take care in assembly of the ring. Secondly, the diamonds that surround the emerald are not matched in color--some are darker than others. This photograph does not clearly show the diamonds due to the limited depth of field, but you can see enough to tell that they are also of very poor quality because of inclusions and chipping. 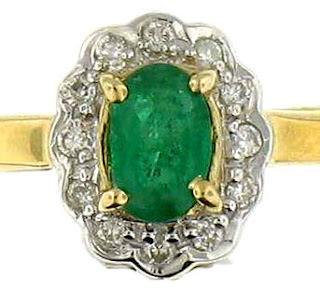 Since the late 20th century, natural emeralds have become very difficult to find, because natural deposits have been mostly depleted. So, folks looking for these gemstones in a reasonable price range should be interested in "lab grown" versions which have become available in the last decade. Yes, these lab-created specimens are actual gemstones, but they are manufactured under controlled conditions, and therefore are almost perfectly clear--that is, they have almost no inclusions. 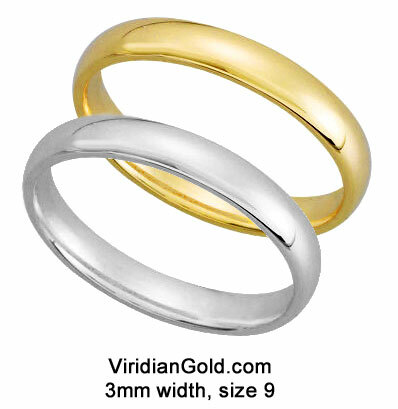 At Viridian Gold, we will tell you if the gemstone is lab grown, and we think that many folks will actually prefer those over the more rare, natural stones because they are much more beautiful! You can read more about gemstones on our Gemstone Information page, which is part of our extensive Jewelry Terminology information section at Viridian Gold.